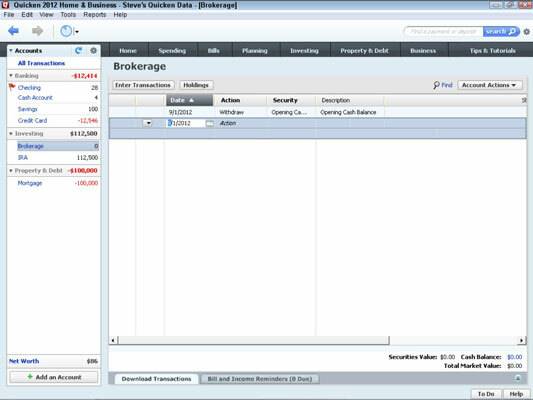 When you are working with brokerage accounts in Quicken 2012, you are able to transfer cash to and from the money market account. One of the big differences between a brokerage account and a traditional tax-deferred investment account is that a cash management, or money market, account is always, always attached to the brokerage account — and is actively used. When you initially set up a brokerage account, your money goes into this account. You purchase your first shares with the cash from this account. And when you sell shares, all cash proceeds go into this account. Because you work with cash in a brokerage account, you need to know how to record the cash that flows into and out of the account. Display the investment account’s window. Indicate that you’re transferring money. Click the Enter Transactions button. Quicken displays the dialog box shown. Choose Cash Transferred Into Account in the Enter Transaction drop-down list box. Record the transaction date, amount, and account. 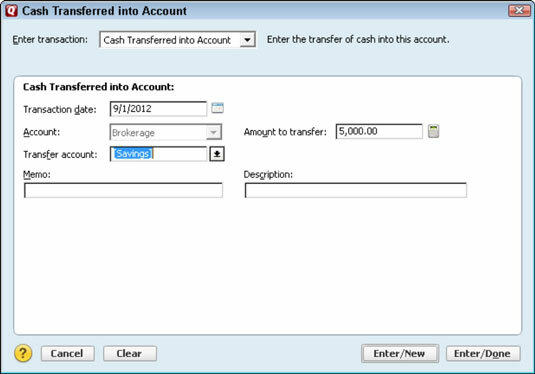 To record the amount of a cash transfer, confirm the transaction date (shown in the Transaction Date text box), enter the dollar amount in the Amount To Transfer text box, and then specify the checking account supplying the cash in the Transfer Account drop-down list box. Display the investment account window. Indicate that you’re transferring money from an account. Click the Enter Transactions button. Quicken displays the dialog box shown. 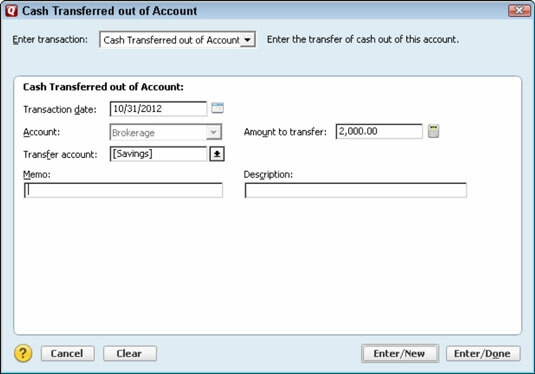 Choose Cash Transferred Out Of Account in the Enter Transaction drop-down list box. To record the amount of a cash transfer, again confirm the transaction date (using the Transaction Date text box), enter the dollar amount in the Amount To Transfer text box, and specify the checking account receiving the cash in the Transfer Account drop-down list box. Then click either the Enter/New or the Enter/Done button.